Trainee therapists often stick rigidly to the therapeutic guidelines that are taught to them on their training course, or adopted from a book, regardless of their approach. 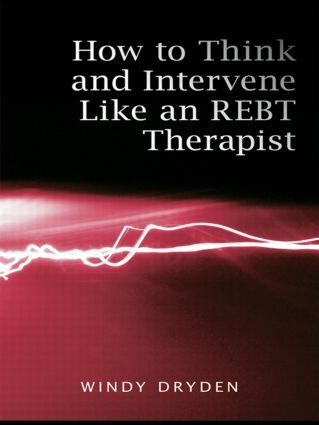 How to Think and Intervene Like an REBT Therapist provides the trainee with an opportunity to discover how experienced therapists think, and how their thoughts influence their interventions when using REBT. In this book, Windy Dryden compares the thinking and intervening characteristics of experienced REBT therapists with the actions of trainees making errors typical of people at an introductory level. By using clinical vignettes, case scenarios and verbatim dialogue he demonstrates how REBT therapists can make better use of the work alliance between themselves, their clients and their trainees, and use REBT more flexibly in practice. This highly practical guide will be essential reading for all those who have recently been introduced to rational emotive behaviour therapy.